The Guinness Book of World Records will have to update one of its Christmas-related entries. Roughly 30 different YouTubers teamed up with multi-faith organization Radiant Foundation to create the largest living nativity scene in the world. 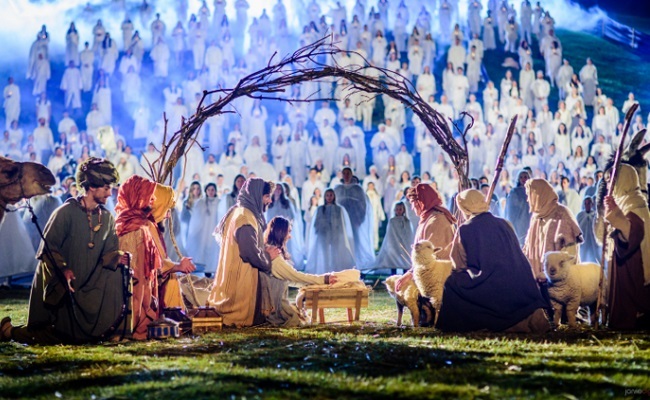 The nativity volunteers gathered on December 1, 2014, at Rock Canyon Park in Provo, Utah to film the Biblical reenactment of angels, wise men, and other visitors coming to see the baby Jesus. Over 1,000 people showed up to help with the production, ensuring it beat the last Guinness Book World Record of only 898 people involved in a live nativity. YouTube musicians such as The Piano Guys and Peter Hollens joined David Archuleta and the Mormon Tabernacle Choir to create a music video surrounding the day’s events. The final result is a majestic composition mixing the hymns “Angels We Have Heard on High” and “Angels from the Realms of Glory” with images from the live nativity production. The video was officially released on December 12 on The Piano Guys’ YouTube channel. Radiant Foundation is giving away the “Angels We Have Heard on High” download for free. Visit thepianoguys.com/sharethegift to grab your copy, and feel free to #SharetheGift with others who may want to see the epic nativity production.